In Bolivia they are the big stars with more than 80.000 Followers on Facebook: The team "BulaciaDakar" of Marco Bulacia and the Argentinean Eugenio Arrieta and a Ford Ranger prototype. They are racing well: In yesterday´s third stage they reached the finish in 04:15:49 hours as 21st, 01:06:41 hours behind the winner Al Attiyah. In the overall ranking they are also on 21st. 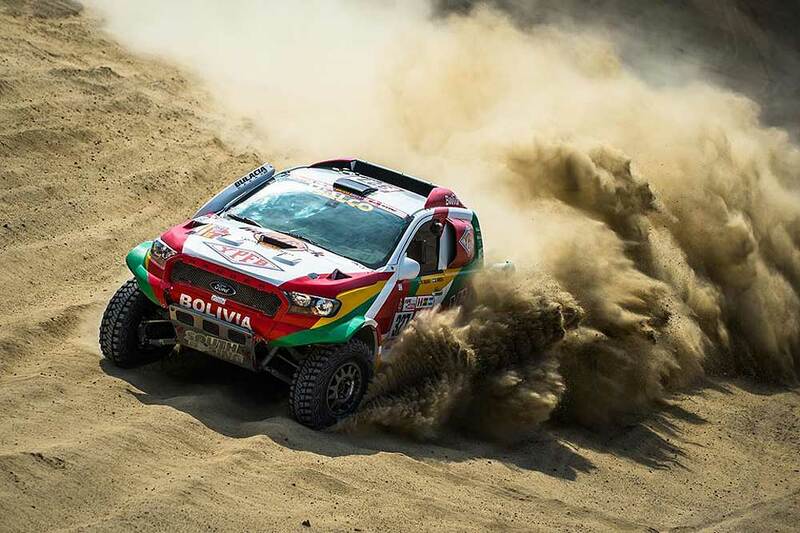 "A beautiful and very technical stage, especially in the Dune sections," reported driver Marco Bulacia. "The performance of our Ford is incredible and we had no errors in the navigation. In one area it was very stony and we totally forgot - perhaps more than necessary - to take care of our tires, which were softer selected for the sand passages. But we had luck." "Today the cars will start in groups of four and we will start together with Carlos Sousa (#315), Team Juknevicius (#321) and the French Overdrive Toyota of Jerome Pelichet (#330)."